Initially I planned on posting the audio but Christmas is a tricky time and we give our tech team the night off so here’s something close to what I said. In real time, it went about 20 minutes. made fun of terrible looking nativity scene. the nativity is not the official symbol of Christmas. All to say that Christmas cannot be ruined by commercialization, seasons greetings, ugly nativities, stolen nativities, santa, reindeer or anything else. It means to much to by any of these things. I post it because it actually went pretty well. Feel free to read the rest. Monday Morning Brief – Last One of 2008. Highlights of the Week: First family Christmas! We loved taking Nathan to see Santa, enjoyed Christmas-shopping for him, and loved taking him to our church’s family Christmas Eve service. Another highlight for me was preaching at the 10PM Christmas Eve service. Seemed to go well and was grateful that my sr. pastor asked me to do it. Disappointment of the Week: Not really sure who gave my the fruitcake. I think it was re-gifted from last year. If I ever find out, they’re off the prayer list. (Didn’t really happen; it’s been a real good week). Listening to: Christmas music. This was the first year that I can remember that I didn’t get tired of listening to it. Maybe I’m getting old but I think it’s also due to better playlists, no radio, and Sufjan releasing a 5 cd set 2 years ago. Just Watched: No Country For Old Men. I’m a year late and I need to watch it again. Really liked it though it was more violent than I was expecting. Great acting and there are too many subtle moments that I need to see again. Reading: Been a crazy week so same as last week but I am enjoying Metavista. Procrastinating On: Making resolutions and making best of 2008 lists. Monday Morning Brief – 12.22.08 – the second last one ever … in 2008. Highlights of the Week: Finishing school felt pretty good. Got an A-. Our Sr. High night to find the meaning of Christmas was a great night. Still hearing a lot of good things from that night. Enjoyed our time at our young adult Christmas party. Templeton Foundation night was cool, feel free to join us if you’re ever free. It was special for Susan and I to do some Christmas shopping for our child, Nathan, we’ve only ever bought for others so this was fun. Disappointment of the Week: … I’ve been thinking, and so far nothing comes to mind … and I am a miserable person so this should come easy. So far all I got is that we missed the Charlie Brown Christmas Special (which I believe I have on DVD – problem solved). Listening to: all things Christmas – Harry Connick Jr.’s new one, received Sixpence’s Christmas as a gift, Sufjan still, since it’s 5 albums, and one that I recommend to you that you can grab for free from Noisetrade, “Sojourn – Advent Songs”. Reading: Just started Metavista: Bible, Church and Mission in an Age of Imagination (Faith in an Emerging Culture Series) by Colin Greene and Martin Robinson. Looking forward to blogging about it soon. Looking Forward to: I was asked to preach the meditation at our 10PM Christmas Eve service. No place I’d rather be on my birthday and hope to bring some of these Advent thoughts to some kind of conclusion that night. May the Lord give me the words and bless those who listen and those who don’t. It’s important to me to enjoy arguments from other perspectives. For one, it allows me to dialogue withothers, two, it helps me maintain some possibility of open-mindedness and three, it sharpens my thinking. Please do not presume that I understand or can understand McCullough’s points from an hour’s worth of discussion on a Tuesday night. Further, I have not read Beyond Revenge and this post is not in any way a rebuttal to McCullough’s book but this more of an exercise in responding to what I gained from the night. As mentioned in the previous post, I really enjoyed McCullough’s dialogue but throughout the evening I couldn’t help but think what he was referring to the effects of human evolution is what my Christian perspective refers to it as part of our sinful, human nature (or to borrow other Biblical language, “the flesh”). I am assuming from the subtitle that “revenge” has evolved in human nature. This is an odd thing for me to understand and while I am happy in admitting my shortcoming in comprehending this, revenge seems to be a very instinctual and obvious response to wrong doing. I’d like to argue that if one can plot against another, it would be just as easy to exact revenge (or retaliate by plotting against if the idea is to avoid the concept or word “revenge”. And what was it before it evolved into “revenge”). The Christian tradition seems to be the likely explanation for revenge. “The Fall”, serves as the moment that we as humanity chose our own ways. In my economy of thought, selfishness should come quite easy to us; at least it comes naturally to me. I couldn’t help but feel that had I changed the wording of McCullough’s words, I could have made this a case for Christianity. And again, I remind you, I have not read the book, nor am I arguing against it but instead responding to what I heard that night at the forum. This is purely amateur and remember, it’s a blog post. Now, I believe the book is more interested in arguing for the evolution of forgiveness. Certainly that is a more appealing concept and forgiveness has to sell more books than revenge (unless we’re marketing to failed republican presidential candidates, ex-girlfriends and the like). First, let’s assume that macro-evolution is true and that we have descended from the caveman (and prior to that, the primate) Even with the coming of society, it seems that we should have less violence today. (I know, I know, evolution is a slow process). Second, what will forgiveness evolve into in the future aside from less violence and more reconciliation among a greater number of people? Will we as a humanity occupy ourselves with more important matters like caring for the poor, sick, depressed, and marginalized? Will we not only forgive but love the offender? Will we turn the other cheek, go the extra mile, and feed our enemies? Is it evolution we need? Because I’d like to make the case that even if Christianity is a made-up religion, it offers a great vision for forgiveness and seems to have done more in 2000 years than the millions of evolution. Now what if Christianity is not a made up religion? What if there is a divine God behind it? Does this mean then that forgiveness is super-natural or some kind of indication of the supernatural? Hmmm. Are those outside the Christian faith capable of this super-natural forgiveness? Certainly. In fact, over the years, some of the best people I’ve met are professing atheists/agonistics. In fact, over the years some of the best people I’ve met were former professing atheists/agnostics. I believe over the years that many good and moral atheists have advanced the Kingdom of God (and that many of them are pre-Christians). I believe over the years that many wrong-hearted, professing Christians have impaired the cause of Christ (and many times it’s been me). If there is a God of love, it would seem that He is more interested in calling all people to peace with Himself and with each other. My theology is not universal. I believe very strongly in the personal freedom of the soul meaning God has allowed us to choose who/what we worship. But if the goal of life is to live in peace and harmony with each other, I have to ask, why wait for evolution to continue its course, why not become a Christian? As a youth group, each year we do a Christmas party in our beloved youth room affectionately called The Fireside Room (it has a fireplace and it it’s a room and since I’m not extreme youth pastor, I have no plans to rename to rename it to the “Inferno Room” or “House Ablaze” … anyway). In previous years, we had the coffee bar going, the carols, I would give a brief Christmas reflection, we may tell a story, and then of course, the White Elephant exchange. Well I Well, I love Silent Night, and Rudolph and I pretty much like all the Christmas traditions (sacred and secular) including the White Elephant thing as much as the next guy but it was time to do something different. I tried to volunteer our group to throw a Christmas party at either a children’s hospital or an assisted living/nursing home. No one wanted us. We may have a terrible reputation that I am unaware of or it points to groups and individuals focus on this time of year more than other times. In keeping with our “you can’t ruin Christmas theme”, I had asked them to bring $5 Starbucks money and our evening began at a outdoor nativity at a nearby Catholic church. Reminding them of the infamous Talladega Nights scene where Ricky Bobby prays to baby Jesus, I shared with our students that this was how we usually picture Jesus, laying asleep in the manger. The meaning of Christmas is so much bigger and everywhere. After breaking up into our small groups, their assignment was to find moments of Christmas and to find ways how they could be bring a moment of its meaning to others in the mall. The rules were simple, they could not spend any of the money on themselves or on anyone on their Christmas list. We were here for to experience God and the “other”. It was great; two groups got together and bought several coats and donated them to a coat drive. Some even gave their own coats. One girl tried to give her money to one who sold trinkets and cheap jewelry from one of those little stands that are outside bigger retailers. The lady gave her 5 sets of earrings that her group got wrapped by those who were raising money for cancer research and then gave the 5 gift wrappers the earrings they just wrapped. They were several other stories but it was evident from the stories like that, they were catching the point. The meaning of Christmas is captured in many places including at the mall watching families and people shopping for others. Not everyone is giving out of formality, some will actually be a blessing. Some are making gifts that will do a similar thing. Many are donating their time, their coats, their resources. It’s my opinion that we tend to look to much to the negative and annoying aspects of the holiday and overlook moments like these. Even in the den of commercialization and materialism, we can remember the love of Christ. No one may have gotten saved (or saved again) but all of us were encouraged, strangers were blessed and I believe God was glorified more by this than another party in our beloved Fireside Room. After we exchanged our stories, I told them the legend-story of the candy cane. You probably heard it or something like it. A candy maker some 300 years ago gave out these shepherd-shaped sugar sticks to children who behaved during the church Christmas concert that had a Jesus the Great Shepherd theme. Later the story evolved to the shape is a “J” theme for the baby Jesus and the red stripe was symbolic of his blood. Yes, even candy can be redeemed and for those who are searching and celebrating Christmas, nothing can ruin its meaning. Since it’s such great reading, only two posts. (ABP) — The act of reflecting this week, in class, on the development of Catholic social ethics resonated in an unexpected way with the situation facing Christians today. It became clearer than ever to me that when Christians become cultural reactionaries, they doom the church to irrelevance. If you read it, I hope you finish. The last paragraph is excellent. Highlight of the Week: Christmas tree shopping with the family. Finishing this semester of school. CC Sabathia, AJ Burnett starting with a healthy Wang, healthy Hughes, Joba, Rivera and without Scott Brochius, Yankee pitching is going to look alright. Disappointment of the Week: This picture. If I had more time, I’d write a letter of complaint. The Jonas Brothers should never be that close to Bob Dylan. If this was display done by a blind man or a poorly programmed droid then I would understand. But this looks to be the work of someone who really does not know music. This is a serious argument to only buy music online (not to mention the high prices at this particular retailer) or at an independent music store. May our eyes be spared from a time of seeing such an atrocity ever again. 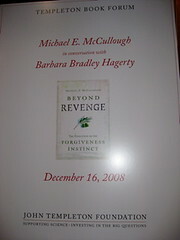 Looking Forward to: tomorrow night’s Templeton Foundation’s Book Forum Beyond Revenge. Listening to: Podcasts and Sufjan Christmas. Last night during at our Senior High Youth Group, we had some fruitful discussion regarding Christmas and the celebration of the holiday itself. I showed them the Advent Conspiracy video and Shane Claiborne’s “Buy Nothing Day” video. We talked about Santa, presents, and the arguments surrounding nativities on public spaces. Very fruitful discussion, especially enjoyed the nativities one where we agreed that they shouldn’t be tacky. In my local town, we have a nativity scene on some public space that also shares a Hanukkah display. I, for one, have no problem with it. Both are appropriate and I like driving past it. I shared last night that there’s a house I saw recently that had the worst nativity set that I remember seeing. It was so bad that I questioned if the house belonged to a Christian or a mean-spirited, non-believer. The Joseph looked like a giant lego and the Mary was unsightly and the whole scene was just terrible. In fact, it made me reconsider my faith and I’m fairly certain that if I were not a follower of Christ, I would have driven past it and it would have re-confirmed my doubts in Christianity. In fact, if any hope, peace, love and beliefs of transcendence had crept into my unbelieving life, I think I would have had to gone some place and repented of these holy thoughts because I would have been at risk of believing. It was so awful, that I think the plastic baby Jesus is trying to crawl out of it as you read this. I feel that some have made the nativity scene the official symbol of Christmas. Although I appreciate symbols and love a beautiful nativity scene, to me, it does not symbolize Christmas for it waters down it’s meaning (again, I write “to me”). Speaking of symbols, I like Santa Claus. I think he’s a fantastic figure. Not more important than Jesus mind you, but fantastic nonetheless. Though I do believe that he is far too exalted, I do enjoy the myth that surrounds him. I like Rudolph and the other reindeer, the North Pole and the elves and the toy-making and all that goes on with it. I like the legend of St. Nicholas and I like buying Coca-Cola with Santa on the label. Why? Nothing spiritual about it, I just like it. Most days, I like the idea of gift-buying. There is goodness in such tangible expressions of blessings (like coming to the Lord’s table and celebrating the Eucharist). Though it is easily overblown, I confess that I do enjoy buying something “extravagant” for a loved one every so often. What I don’t enjoy (nor understand) is the need to buy a sweater or gadget or mug for every one you know and I have never been able to comprehend how fruitcake ever came to be a suitable gift for anyone (my personal theory is that it was meant as a prank but someone decided to make some money off of it). If you’ve been able to read this far, here’s where I am going with this. I don’t believe that Jesus can be taken out of Christmas. I do not buy into this helpless feeling that you can lose the meaning of Christmas (just like you can’t ruin a trip to Jerusalem just because those guys keep trying to sell you the Bibles with the wooden covers on them. If you’ve been there, you know what I mean). Forget about “seasons greetings versus happy holidays versus Merry Christmas”, Christmas only loses its magic if you were focused on the wrong parts of it to begin with. You can’t ruin Christmas and if it is then it was our own fault for that would mean our hearts were not focused on worshipping Christ or celebrating the Incarnation of our Lord. Shane Claiborne posted on Sojourners about consumerism, Black Friday and the season of Advent. Saw this cool site called I Am a Second from Adam McClane’s blog. The Everyday Liturgy Quarterly – Eucharist Edition. Not just because I have an article in it but because my evangelical friends do not read or dialogue enough about the eucharist. Especially appreciated Scott’s post entitled, “Does Communion Promote Community Among Christians? Highlight of the Week: Enjoying taking Susan out for birthday dinner. Our Christmas cantata was beautiful. Drama of the Week: Our church installed a new fire alarm system earlier this year and it has these lasersensors to detect rising smoke high in the sanctuary. Unfortunately on the balcony side, near the sensor is where we have one of our lighting control panels that are utilized more during the holidays. This being our first holiday event, we tripped them twice in one week. More to it than that, like when I silenced the alarm (after knowing there was no chance of danger) and allowed everyone back inside. It’s not policy but Icannot figure out why these laser sensors have thesame protocol as an actual smoke or monoxide detector. Anyway, while some thanked me from getting them out of the cold, others were not as happy with me. There was no fire, the alarm was piercing loud, it was 30 degrees outside, children, older people, were freezing and no offense but it was taking a real long time for the fire trucks to show (God bless them, I appreciate immensly what they do), at some point human leadership needs to discern and intervene, otherwise, you are living in the Matrix. So maybe next week I’ll be competing with Evan and jump hunting or our families will be sitting next to each other at The Well on Sunday mornings and at Thomas’ The Plant on Sunday evenings. Reading: schoolbooks and everything Ecclesiastes. When I grow up, I want to be “Qohelet” (but less jaded). Saw: 4 Christmases with Vince Vaughn and Reese Witherspoon. Funny and cute. We hadn’t been to the movies for a while but it was alright. I did like the church scene though. Not as great as the Little Baby Jesus prayer in Talladega but pretty good. Looking Forward: to the end of this semester. I’m enjoying working on this Ecclesiastes paper but will be glad when it’s over too. Getting more into the Christmas/Advent season.